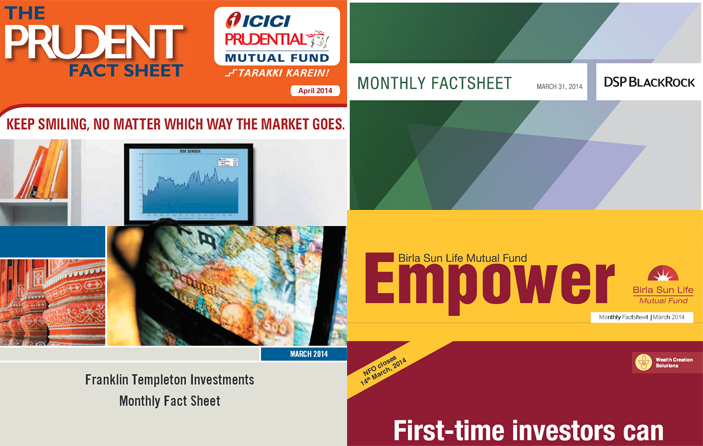 Most mutual fund houses usually publish monthly reports, also known as factsheet that contain critical information for each scheme. The fact sheet contain the scheme objectives, important information related to the portfolio of each scheme and performance details of all the schemes managed by the fund house. The fact sheet may also contain the fund manager's commentary on debt and equity markets. The fact sheet serves as a guide for both existing and potential investors to make investment decisions. However, retail investors very often do not read the fact sheet, even though it contains a wealth of information and is published every month. In this article, we will discuss how to effectively study the key information elements presented in the mutual fund factsheet, specifically for equity funds. In this article, we will use the March 2014 factsheet of the Franklin Templeton Mutual fund to evaluate, as an example, the Franklin India High Growth Companies Fund from Franklin Templeton stable. Below is an extract from the factsheet. What are the important information elements in the fund factsheet? The investment objective articulates what the fund manager intends to achieve. Equity funds aim to provide capital appreciation over a medium to long term by investing in a portfolio of stocks. The investment objective further describes the nature of stocks in the portfolio, e.g. large cap stocks, small and mid cap stocks, sector specific stocks, diversified portfolio of stocks (multi-cap). Investors should ensure that investment objective is aligned with the financial planning objective of the investor. In the case of Franklin India High Growth Companies Fund, the investment objective says, “An open-end diversified equity fund which seeks to achieve capital appreciation, through investments in Indian companies / sectors with high growth rates or potential”. There we can infer that, this fund is a diversified equity fund with a high growth focus. Diversified equity funds aim to minimize portfolio risks, by diversifying stock specific or sector specific risks. This fund is suitable for investors with a long time horizon and financial objectives like retirement planning, planning for children education etc. Mutual fund investors often read the disclaimer that “past performance is not a guarantee of future performance”. The future performance entirely depends on the portfolio of the fund. Therefore, this is the most important section of the fact sheet. However, retail investors who do read the fact sheets often ignore this section. Their argument is that, they have entrusted the fund manager to make equity investment on their behalf, since the investor themselves do not have expertise to invest in stock markets. That argument is valid. Investors need not pay a lot of attention to which stocks the fund is investing in. However, they should pay attention to portfolio weightings, both in terms of stock allocation and sector allocation. Investor’s should look at the top 10 stock holdings of the portfolio. The percentage of top 10 stock holdings will tell the investor whether the portfolio is sufficiently diversified or is focused. A focused portfolio has the potential to generate higher returns over a specific time frame, compared to a diversified portfolio. However the volatility of the portfolio is also likely to be high. For a diversified equity portfolio, the top 10 stock holdings should not be more 40 - 45% of the portfolio value. Investors should also pay attention to weightings to individual stocks in the portfolio. A portfolio, reasonably diversified across top 10 stocks but with very high weighting on an individual stock, may be exposed to volatility due to that stock. In a diversified equity portfolio the weighting of an individual should not exceed 5 - 6%. Let us look at the top 10 holdings of the Franklin India High Growth Companies Fund in fact sheet extract (Figure 1). The asterisk in the company name in the portfolio section denotes top 10 holding. The top 10 holdings account for 45% of the portfolio value and the top holding, ICICI Bank is about 6%. This shows that the portfolio is well diversified. Investor’s should also look at sector allocation in equity funds. A diversified equity fund should invest across a variety of sectors. If the weighting of a particular sector is high, then the fund is exposed to sector specific risks. Funds which had a high exposure to cyclical sectors were the worst hit in the market downturn of 2008 and 2011. However, when evaluating sector allocation, investors should also consider the investment objective and style. Let us look at the sector allocation of the Franklin India High Growth Companies Fund in the factsheet extract below. Banks have a higher percentage in the sector allocation. This is definitely a watch out for this fund. However, since the fund managers aim to generate higher returns, by investing in companies / sectors with high growth rates or potential, as stated in the investment objective, it is understandable that they have a higher weighting for banks which is a high beta sector. However, investors should note that such a sector composition will expose the fund to higher volatility compared to diversified equity funds with more equitable allocations across sectors. Strong performers aim to outperform the market and generate good returns across all time scales. In bear markets the decline in NAVs of the fund should be lesser than the market and in bull markets the fund should generate better returns than the market. The fund fact sheet contains the performance of the fund versus the market benchmark both an annual (financial year) basis and on trailing annualized basis (last 1 year, last 2 years, 3 years, etc till the end of month in question). Let us look at the performance of the Franklin India High Growth Companies Fund, over various time periods both on annual and trailing basis, in the factsheet extract below. The fund has outperformed the market indices both in bear market (FY 2011 – 2012) and in bull markets (FY 2012 – 2013 and FY 2013 – 2014). Even in terms of annualized returns over the 2, 3 and 5 years periods the fund has outperformed the market indices. The fund factsheet also shows the growth of a standard investment of Rs 10,000/- since inception of the fund and over various time scales. Other than returns there are several other fund performance measures like beta, standard deviation and Sharpe Ratio. is a measure of fund volatility. A fund portfolio beta of 1.0 indicates that the fund will move in perfect correlation with the market benchmark. A fund portfolio beta of 1.2 means that the fund is 20% more volatile than the market benchmark. A fund portfolio beta of 0.8 means that the fund is 20% less volatile than the market benchmark. Refer to figure 1. The fund portfolio beta of Franklin India High Growth Companies Fund is 0.93. That means that the fund is 7% less volatile than the market. measures the dispersion of the fund’s monthly returns over a specified time scale from the mean or average returns during that time scale. Higher the standard deviation, higher the risk and volatility of the fund. Refer to figure 1. The standard deviation of the Franklin India High Growth Companies Fund is 5.14%. However, standard deviation on a standalone basis as a measure of fund’s performance is of little use. Investors should compare the standard deviation of the fund with its peer group. Research firms like Morningstar calculate the standard deviations of various mutual fund schemes. Investors should compare the standard deviation of the funds in their portfolio with their peer set to get a sense of relative volatilities. is defined as the ratio of excess return (i.e. difference of return of the fund and risk free return from Government securities) and annualized standard deviation of returns. Higher the Sharpe Ratio better is the risk adjusted returns of the fund. Refer to figure 1. The Sharpe Ratio of the Franklin India High Growth Companies Fund is 0.1. As with standard deviation, the Sharpe Ratio on a standalone basis as a measure of fund’s performance is of little use. Investors should compare the Sharpe Ratio of the fund with its peer group. Research firms like Morningstar calculate the Sharpe Ratio of various mutual fund schemes. Investors should compare the Sharpe Ratio of the funds in their portfolio with their peer set, to get a sense of relative risk adjusted returns. Portfolio turnover is a measure of the churn of the fund’s portfolio, over the period of review. It signifies the number of shares bought or sold as a percentage of the fund’s stock portfolio. High portfolio turnover indicates high transaction or trading costs, and therefore impacts the return for the investor. However, high turnover ratio is not necessarily a bad thing. It depends on the investment approach. Typically, a growth fund will have a higher turnover ratio and a value fund will have a lower turnover ratio. Also, one needs to look at growth or decline in Assets under Management when evaluating portfolio turnover. Refer to figure 1. The portfolio turnover of the Franklin India High Growth Companies Fund is around 36%. Is it good or bad? As per a report in Mint, the average portfolio turnover of diversified equity funds in September 2013 was 44%. Compared to the average, the portfolio turnover of the Franklin India High Growth Companies Fund is lower. In my opinion, at the end of the day what finally matters to the investor is the return on investment. If the portfolio turnover of your fund is increasing, but at the same time your returns are higher, then you should not be concerned. However, if you notice that your returns are lower while the portfolio turnover is higher, then it is not such a good thing. Expense Ratio is capped as per regulations at 2.5%. A high expense ratio implies a more expensive the fund. Refer to figure 1. The expense ratio of the Franklin India High Growth Companies Fund is 2.4%. As assets under management of the fund increase, the expense ratio should go down. While high expense ratio impacts the final returns of the investor, what ultimately matters to the investor is the return on investment. Therefore, while expense ratio is important, investors should always evaluate it in conjunction with returns. Mutual fund factsheets contains a wealth of information that helps the investors in making an informed decision whether to invest in a fund, stay invested or redeem their units, as the case may be. If you follow a systematic approach in reviewing the fund factsheet, as described in this article, you can glean the most important data points from the fact sheets in order to make effective investment decisions. In the next article, we will discuss how to effectively evaluate the information in a debt fund factsheet.